When faced with abominable ambiance, arm yourself with ambient protection. Giro’s Ambient Skull Cap offers protection from wet, cold, and windy weather in an ambient package. From the micro-brim to the extended neck hem and ear flaps, this cap envelopes your head to provide comprehensive protection from the elements. Coated with DWR (Durable Water Repellent) and armed with a wind resistant front panel, this cap fights to hold its defensive lines against the onslaught of rain, spray, wind, and chill while the plush, fleece-lined interior maintains a cozy refuge. Smart Seam construction helps the cap lay flat against the skull, eliminating pressure points, hot spots, and general irritation that conventional seams can cause. The same DWR treatment that repels water infiltration also facilitates moisture wicking, preventing that head-in-a-sauna sensation we all hate. Durable Water Repellent (DWR) treatment. Small / Medium: 53 – 58 cm. Large / X-Large: 59 – 65 cm. This hat rocks. It was a replacement for a PI thermal hat that was out of stock. I love the the way the hat wicks away moisture and the brim keeps the rain off of my face. I rode 40 miles this past Sunday in a cold rain and my head stayed dry and warm. If only it could protect me from the spray off the wheel in front of me. I've given this a try, & it's working well. Covers the ears, but you can uncover them on the fly for temperature control. Not overly warm- I used a 2nd thin skull cap for a 40 ride, fits under helmet well. Get the large size- tight fit cuts circulation. when in a low position- a problem with many caps including the merino one. used this cap in temps from 40's to the 50's. keeps your head warm. the ear flaps want to flip up when riding. Good design,warm,wind proof front and breathable. Excellent Giro Product. Giro is my go to for riding stuff. Wind proof great. Ear coverage great. There is nothing to dislike about this product. Material is great. Just got it rode about 5 rides in pretty cold temps. Love it. Great under my ski helment also. I ride year round and wear some kind of hat under my helmets round. This is perfect for fall and spring rides. Fits perfect. 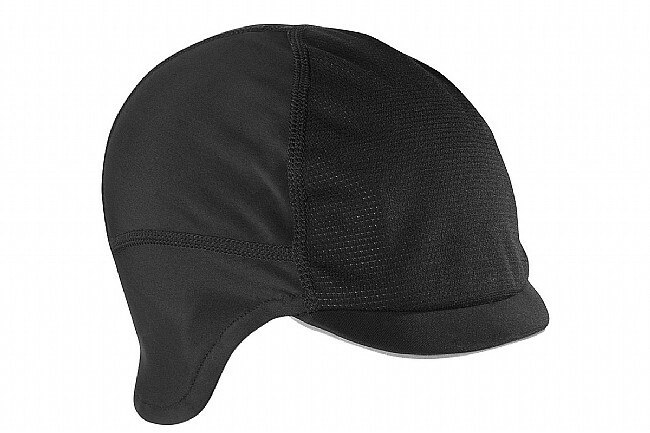 This cap is really good - I use it everyday on my winter commuting rides. I covers my ears and the small brim is good as well. It conforms well to my head and fits snug, but not too tight. I had an initial concern that it would be either too bulky or not warm enough. Neither was the case. I am surprised at home warm it is for being so thin, but when the temperature drops below 15 F, I put a balaclava over it and I am still able to get my helmet on.